His name was Vahid Zahirovic, 35 years old, from Jablanica. He died midday on October 23 at the minefield of Zaloski Grabes, near Bihac. He worked for a local company, the Association for Demining. He is the last in a long series of victims in the Bosnian community of deminers. Between 200-250,000 mines (1) are still scattered on around 2,000 square kilometres in BiH, thirteen years after the end of the war. The registered victims from a landmine explosion since 1992 now total 5,003 persons. Most of the victims, 3,339 persons, were wounded or injured during the war. The rest of the casualties occurred during peacetime. The minefields generally are found on the former frontlines in the war. After the battle lines dissolved in the summer of 1995, most minefields ended up in the Federation of Bosnia and Herzegovinia, one of the two entities comprising the country. According to the goals set by the "Mine Action Strategy", a document approved by the Council of Ministers of BiH on April 24 2008, Bosnia should be risk-free of mines by 2019. BH MAC, a structure within the Ministry of Civil Affairs of BiH, coordinates and supervises all demining activity in the country. In collaboration with former militaries, BH MAC provides, when possible (2), the cartography of the minefields. The office accredits the organisations of deminers; certifies them, and controls their activity. Currently, 35 certified organisations exist. They comprise for-profit companies and humanitarian non-governmental organisations (NGOs) such as the Italian Intersos, or the Norwegian People's Aid, whose operations in Bosnia are funded by their respective governments. The for-profit companies bid for the contracts, many of which are advertised on International Trust Fund, an international fund on demining, with a legal seat in Slovenia. The demining costs per square metre can vary greatly, depending on the type of terrain. The general trend, however, is a constant decline in price: "Immediately after the war, the price was reaching 20 convertible marks (10 Euro) for a square metre. Now the price is two marks per square metre," explains Svjetlana Trifkovic, spokesperson of BH MAC. The price is set from the bids arriving under the tender. The winners are assigned a chunk of territory to demine. The best offer, as in any other tender, for example with construction work, most often coincides with the lowest price: "Representatives of BH MAC, ITF, and the donors make up an evaluation commission that assesses the experience, the capacity of the organisation, the work plan. Of course, the most important thing is the price," says Trifkovic. An estimated 3,000 deminers operate in BiH. Many deminers are former military officers. They work for 700 Euro per month on the average. Over the past years, the deminer community has suffered around a hundred casualties. Until now, 40 incidents have resulted in death. The statistics do not seem to indicate a decrease in the number of incidents. On the contrary, this year's record has been especially depressing, with six killed and two injured, in addition to the two policemen and one representative of the Civil Protection killed by landmines while trying to mark a newly discovered minefield. The vast majority of recent incidents, including that which took the life of Vahid Zahirovic, has been caused by the Prom landmine, a mine produced in the former Yugoslavia. When activated, these mines bounce and explode in the air, splitting in hundreds pieces of shrapnel. "They are the deadliest. With the other types, you can manage. These are a disaster. If they explode, you should thank heavens if your colleague 50 metres away survived," says engineer Vito Alfieri Fontana, expert of Cooperazione Italiana and in charge of Intersos in BiH. The landmines have been installed during the 1992-1995 war. After many years, time has different effects on the various types of landmines. There can be "positive" decay for example, with detonation capsules becoming more difficult to activate, but the process of decay can also be disastrous: "Some landmines become more unstable over time, and this makes work more dangerous," continues to explain Alfieri Fontana, "and this is the case of Prom. If the internal mechanism wears out, and the springs lose force, they can explode earlier. Sometimes brushing them is all it takes." The Prom landmines are too dangerous to be defused. They must be isolated and eventually blown up by an explosives expert. This procedure is set by the standard demining manual used in BiH. Deminers have many rules to follow in their work. For example, they must maintain safe distances in order to avoid multiple deaths such as with a Prom. However, things do not always work as planned. Vehid Jusufagic and Enes Subasic were killed on the mountain of Crni Vrh, near Maglaj, on July 12. A Prom mine took their lives when demining in the locality of Krc. Admir Redzic and Fahrudin Hodzic were killed, while their colleague Enver Dautovic was seriously wounded, by a Prom explosion on the mountain of Ozren, on March 18. They were demining in Karanovac, in Sprecanskom, municipality of Petrovac. On that occasion, the local press blamed the malfunctioning of the metal detectors, which were disrupted by the many metal objects and materials in the ground. 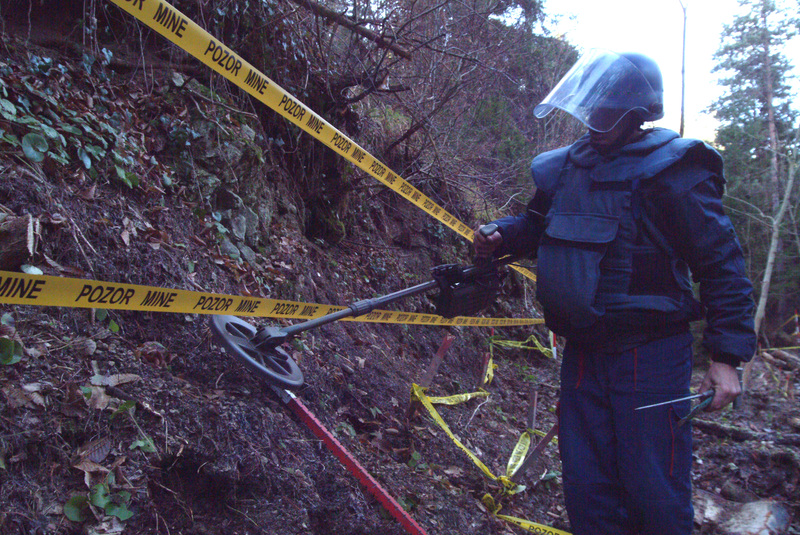 On December 18 2007, another two deminers were killed by a Prom in Ljubinje, near Bancici. When asked why so many casualties in isolated incidents could occur, the BH MAC spokesperson, Trifkovic, responded: "Sometimes the demining organisations do not respect the procedures. They try to work faster, to complete one field in order to be able to compete for the next contract. If you try to analyse the last incidents, most happen to for-profit organisations." These for-profit organisations depend on providing the lowest cost bid during the tender offer. Given the tender-based funding and the general reduction of available funds, Bosnian deminers apparently must work ever faster. Once they have secured a minefield, in order to optimise earnings, some organisations place primary importance on completing the work in the least time possible. The system starts to resemble piecework. In such a situation, the Prom mine is a problem. The procedures necessary when working with these mines slow down the process: "You need a lot of time to isolate a Prom. You must close the passage and block a part of the field", a local source wanting to stay anonymous explains to me. "If an organisation is in a rush, the deminer could approach the mine and try to unscrew it, digging around it and hoping there are no traps. This is very dangerous. If things go well, however, at the end of the day they put in the report that they found an already defused Prom. Or, the mine goes unreported. One could also be tempted to put it aside, just in case. BiH is a signatory to the Treaty of Ottawa; it can neither produce nor store landmines. But, if the political situation in the country deteriorates, they could become useful." The deminers' productivity is regulated very precisely with limits that cannot be exceeded. The number of square metres per day varies according to the number of landmines identified and the methods of work. If you use the metal detector, for example, you can do up to 100 square metres a day. If you also use the "stick", that is, the rod which serves as a probe, you can do from 35 to 50 square metres. Only with the stick, you cannot do more than 10 or 15 metres a day. These are the rules. "However, what also happens is that six deminers are reported to be working on a field whereas in reality only three are working," continues the same source, "Although this is work under the counter, you are paid by piece, you do more square metres, and you earn more. This is the situation for a deminer in some organisations. When incidents like these happen, you understand that the lack of choice of the people who have to do this job, combined with the imperative of companies to make profits, cancels every security precaution. You take off the jacket, or the helmet, because you sweat. It is all connected. You have to rush; all the company cares about is results. In some cases, you find out that the minefield is sub-contracted and that the work is done by just about anyone." The phenomenon of sub-contracting of minefields is also confirmed by Trifkovic ("There have been cases, yes. "), even if she underlines that BH MAC does frequent monitoring "of sites where breach of standard procedure is suspected." The work of a deminer is extremely difficult; it requires strong concentration. According to the chief of Intersos in BiH, the people who do this job "have to be continuously retrained, because with the years the brain tends to get used to the risk, to diminish it, or not register it. One could also get 'hooked' on the landmines; adrenaline makes you do things you should not do." The human soul is incomprehensible. However, statistics are not. The humanitarian organisations that work in BiH have a stable budget, and do not depend on the tenders; these non-profit organisations have a very low rate of accidents. They have not had one single incident this year. Demining requires a tranquil mind and all the time needed to do the job. On the other hand, nothing is more unpredictable than a minefield. If a field has double the number of mines than foreseen, it messes up your calculation. For the humanitarian organisations, it is simple: they write to the donor and explain the delay. For the for-profit companies, it is different. Costs have been set with the contract and it is not easy to change things during the works. Winter has already started in Bosnia. In early November, snow began falling in the mountains. Snow has alredy showed also in Sarajevo. The season has ended for the deminers. They must wait for spring, and hope that the new season brings more dignified work conditions. And, no casualties. 1 Around 220,000 mines have been identified according to BH MAC. Some experts estimate the number of still unexploded mines could reach 300,000. 2 "We have excellent collaboration with the military. However you have to keep in mind that not all the minefields in BiH have been created by military officers. Around 60% of the mines have been placed by civilians, not the soldiers. These are improvised minefields, without any cartography", says the BH MAC spokesperson. For mines placed by civilians, BH MAC must rely on reports from local informants. In some cases, a field becomes known only after an incident.